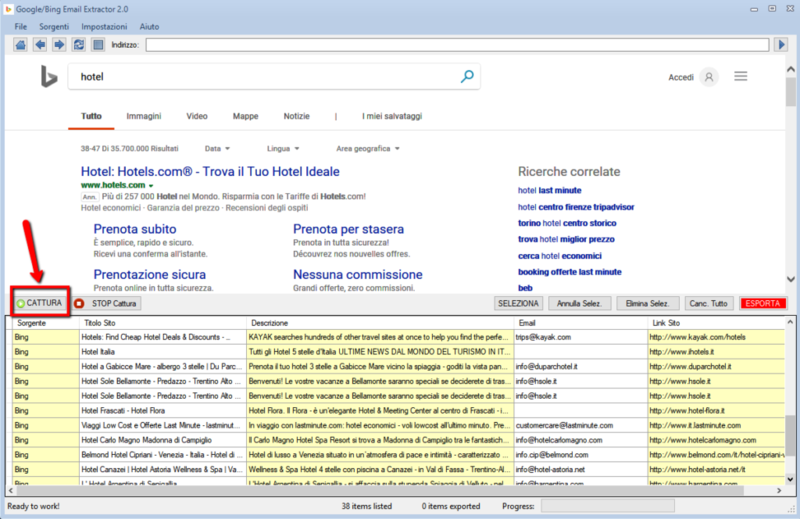 When we talk about search engines we refer essentially to two “giants” of the sector, that is GOOGLE and BING. All the websites in the world are present in these two search engines and therefore they represent the primary source for those looking to capture data from the Web, in particular the EMAIL addresses and PHONE numbers. 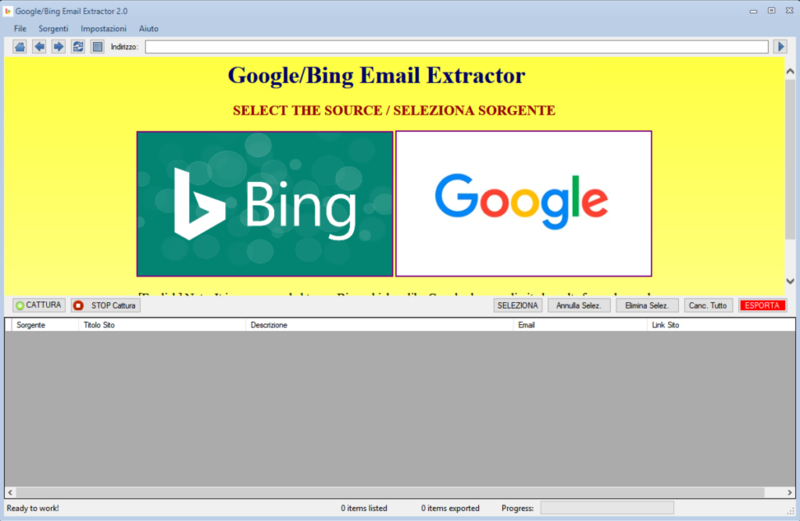 If you want to extract email addresses and phones from Bing and Google Search, or better from the search results presented by these two search engines, you can now rely on our GoogleBing Email Extractor software. 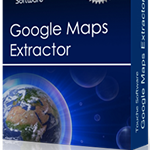 It is probably the most powerful and innovative WEB DATA EXTRACTOR because it leans directly to the search engines to capture the addresses (URLs) of the sites listed in the results first and then goes to look for any email address in each of them. 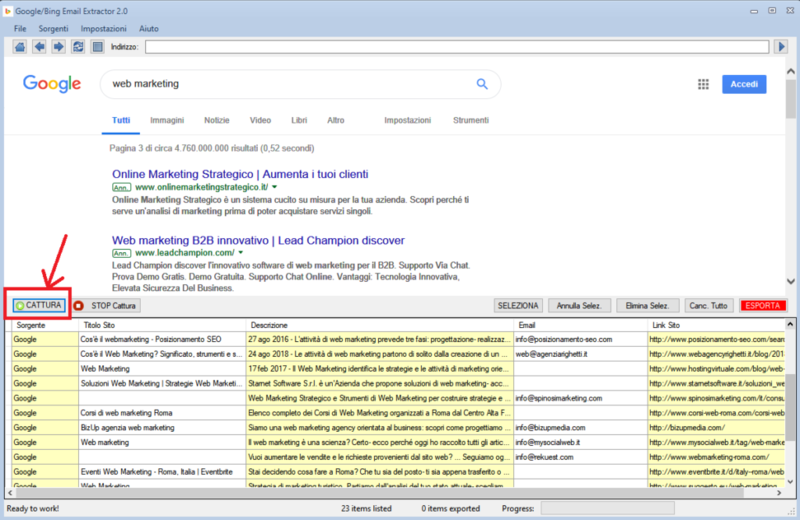 This tool is also able to capture further details of the results such as the site title and description. 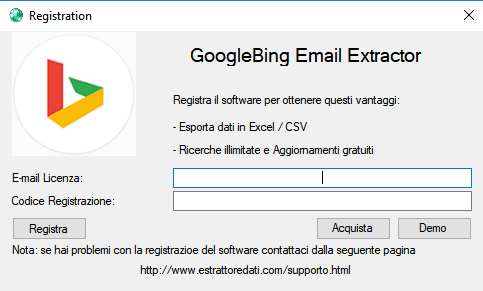 Here are the simple steps to follow to use the GoogleBing Email Extractor and extract all the possible emails addresses and phone numbers for certain keywords. 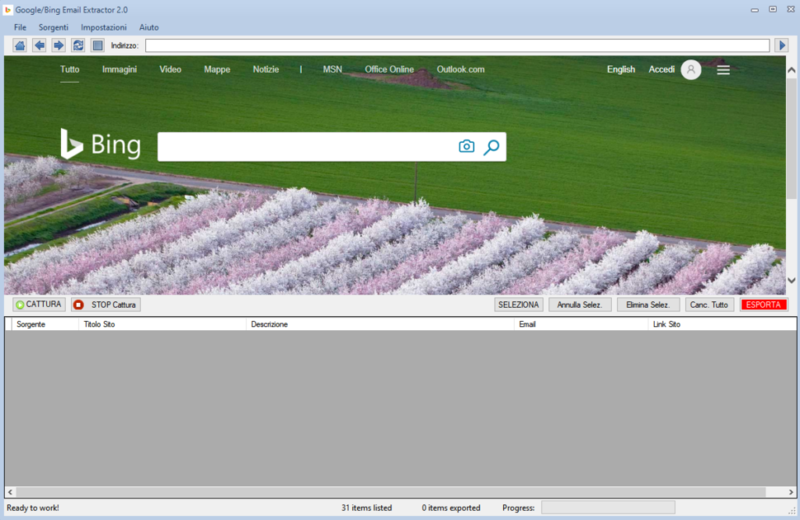 As you can see from image above, you can choose between the two search engines: BING and GOOGLE search. 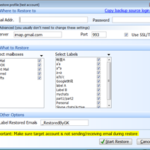 They are both great for searching the Internet and then capturing email addresses from various websites. You can use both sources to capture as much data as possible. 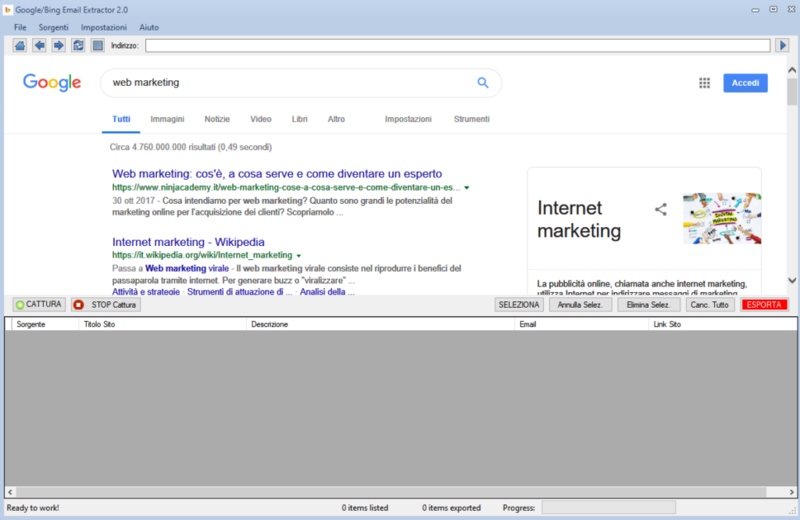 The advantage of using BING is that it shows UNLIMITED results; Google could show a limited number of data for each search. 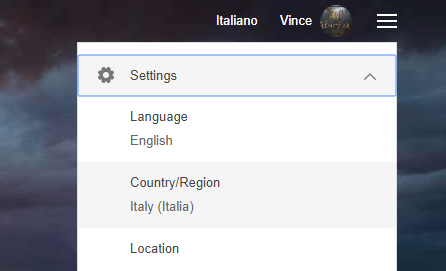 Then you will be able to choose the country/region desired for your searches. 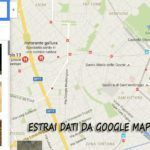 After the search results appear click on the GET DATA button and the AUTOMATICALLY program will start to extract all the data from the results: site title, description, email address, website URL and PHONE numbers. 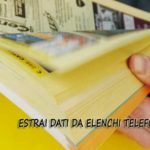 The e-mail address and phones will be searched directly on the website of the result, so it will be 100% consistent with the search you made. 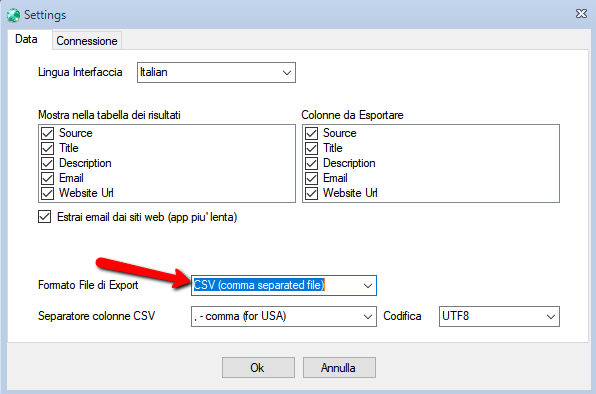 Once you have captured all the data click on the SELECT button to select all the results and then on EXPORT to export all to an EXCEL or CSV or TXT file. 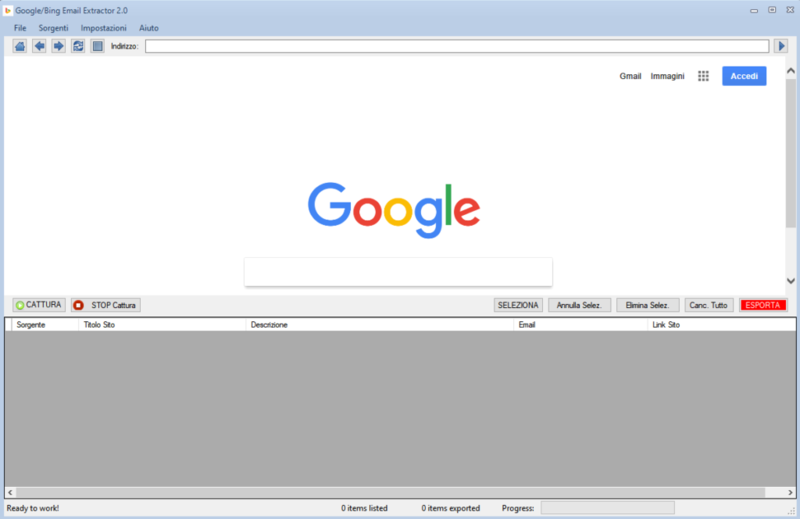 From this window you can also choose the language of the program and set the column separator for the CSV file. 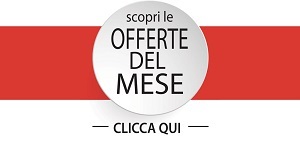 In the window that opens you will need to enter the email and registration code obtained by email and click on REGISTER to activate the software.